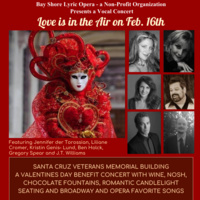 LOVE IS IN AIR Valentine’s Concert Feb. 16th, 2019 performance admission price includes Chocolate Fountains, Charcuterie, Wine, Romantic Seating, candlelight, Chocolate favors & wine..........and of course, the entertainment! I am suggesting my friends to visit the blog and get more information about college helping services and more https://www.topaperwritingservices.com/ info. The great writing concepts and evaluating the informative connections for useful programs.